Ministers said Apple would start an initial manufacturing operation in the state, whose capital is the tech hub Bangalore, in April. The tech giant has a 2% share of India's mobile phone market, well behind South Korean rival Samsung. Apple has yet to officially confirm the plan, saying only that it is keen to "invest significantly" in India. But Priyank Kharge, minister of information technology and biotechnology in Karnataka, told the AFP news agency: "We have an understanding with Apple and we expect them to start manufacturing in Karnataka by the end of April." Reports said the plant is being set up by Taiwanese manufacturing company Wistron Corp. Despite the low percentage of sales, Apple has almost half of the market for premium phones, which start at around $450 an item, and its sales are growing fast. Apple has held a series of meetings with government representatives at both state and national level and is understood to be pressing for concessions before going ahead with such a move. Apple's biggest manufacturing partner is Taiwanese giant Foxconn, which runs the biggest iPhone factory in the world in China. Apple is currently unable to set up its own branded stores in India, which has a raft of rules to curb the activities of foreign companies. Earlier this week, Apple reported its first rise in sales in nine months after strong Christmas sales of the iPhone 7. 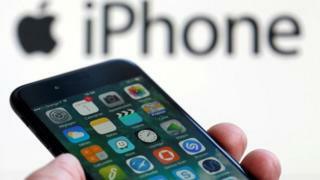 The firm had suffered three quarters in a row of falling revenues as mounting competition, particularly from Chinese rivals, hit sales of the iPhone. Indian media has been speculating about Apple for a while. The iPhone is much coveted as a status symbol in the country, but it's very expensive for most people. They range from $194 for a 16GB version to the top end iPhone 7Plus which costs about $1,164. The bulk of rival smartphones on the market in India cost about $100-$120. But the hope is that manufacturing locally will bring iPhone prices down. I spoke to Karnataka's information technology minister, Priyank Kharge, who said there was a fierce competition among Indian states to woo Apple to set up a manufacturing facility. Although Apple is officially saying only that it will invest heavily in India, he confirmed that the tech giant has declared an intention to first start assembling the phones there and then move on to manufacturing. And by getting Apple to set up in Karnataka, he hopes says it should help promote to region's ambition to become a location for high-end manufacturing.